The weather has warmed up enough to be nice to go back to the workshop and carry on the 59 El Camino project. I am at the point of cleaning the inside of the doors and sanding and minor metal prep for paint. Soon I will be doing the body prep (minor) for paint. My windshield is cracked and I decided to replace it now, rather than after paint and interior reassembly. 1. I shopped used windshield. Priced around $200 plus ship and insurance plus local install, with every installer whining about...no guarantee,not my glass, etc. Local Henderson glass has 2 in stock, total $410, installed in my shop. 2A. what an incredible project...so many pieces, inside trim, outside trim, need to remove the cowl to get at screws, need to pull back the headliner to take off upper outside trim...man. What a commentary on America's industrial might...the manpower to conceive, to design, to engineer, to fabricate and an army of workers to assemble...I'm imagining the variations on 16 different Chevy models for 1959 (did anybody say Pontiac, Olds, Buick too?) Mine's a Texas car and all screws came out although a few with heavy persuasion...pretty good material quality to take that pounding and channel locks and still come out of the hole after 50 years, eh? I found two finger size rust holes on the passenger side under the stainless. and a mountain of dirt and dried leaves stuck under the trim. It is particularly good to find and repair now (sandblast, cut, fabricate and weld) before the new windshield is in and risk heat by the glass, eh? So...what at first glance was heartbreak (hard disassembly and found rust holes) are actully good news, at this time..and you know what...I really like working on the car stuff. Boy, Steve do I. Have fun with the resto. I always do. But then sometimes its the help that you get that makes it such a good expireince. My brothers and my sons are always a part of the process. Its those late night gotta get done things that we look back on and laugh later on. Good luck my friend and keep us updated on your progress. Steve, you have always have some great stories. Whether they be road trips with your Pop in your T-Bird, collection updates, or your classic Challenger, you always have cool insight into the fun stuff your up to, including reading material you keep in you dental office. Thanks for the good stuff man! Always a smile to my face. Thank you Kramtrah. I enjoy the car stuff and working on the projects, and I enjoy sharing them through my writing. I'll keep on doing so. Watch for a new installment soon. In the last installment, I reported the discovery of two rust holes under the stainless door trim, and how it was fortunate to repair them before the new windshield was installed, so as not to damage the new glass with the metal temperature from welding. As part of that repair, I needed to sandblast that area and the area over the door on the driver’s side, to eliminate the pitted surface rust, and determine how far the rust extended. Sandblasting is an unpleasant job. It is hot, dirty, awkward and time consuming. More over, it makes a really big mess in the shop. It does not matter if the hole is small or if blasting a whole fender, it is just a long, messy job with big cleanup at the end. Sand gets everywhere, in light fixtures, on shelves, nooks and crannies of the car, down your pants…everywhere. It is important to get the workshop and the car really clean after, so that specs of sand do not find their way into filler, primer or paint, or in hinges or brake linings. Blasting the new found rust areas was not a big deal, but it did spray sand all over the shop. With a mess to clean up anyway, I inspected the rest of the body for any other spots that might require a blast. 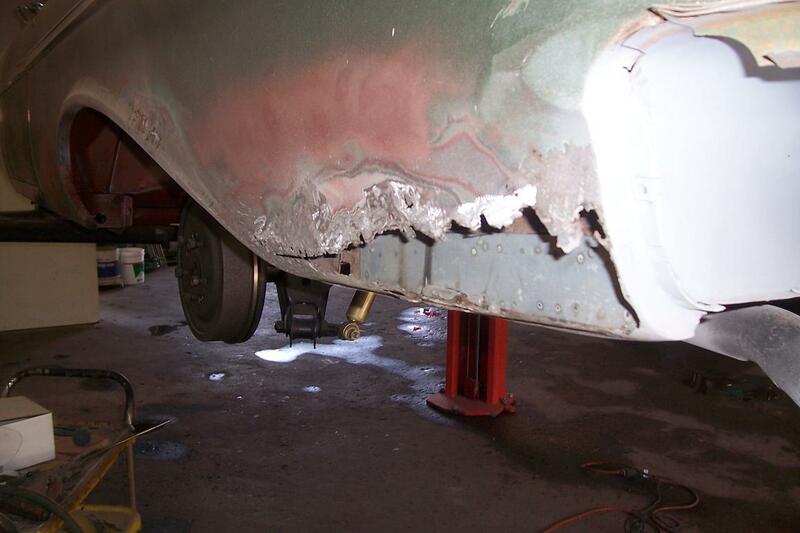 The seller of the car, told me he had repaired the rusted areas over both rear wheel wells and primered those areas. I have had the car in storage for nearly 20 years, and those contours always looked good. I noticed some bubbling in those areas, and took it as new rust forming under primer overspray. When I sandblasted those areas, I discovered rust alright, blistering up through the ¼ inch of body filler over it. I thought maybe I could just sandblast the “new” surface rust, or if needed, weld a repair to the existing repair. Not so…as I explored the repaired areas under the primer, I found no metal to work with. The rust hole pitted and lacy metal had been pounded in and filled over. In places where the gaps were large, aluminum siding scraps had been wedged in and fastened to the car with roofing nails, then filled over. Some places had large builds of fiberglass to hold the overfill. Ultimately, I cut out all the old repair, cut down to solid metal and conditioned it with phosphate. The metal is now ready for fabrication and welding of strong metal, then skim coat filler over it for final contour. Certainly, additional work that I had not counted on. Given that the other guy’s work held well, for nearly 20 years, and that the rust would have worked through my new paint soon, and the ultimate fix is more extensive, I have to agree that “the rust holes had been fixed” before he sold me the car. Future Truck: 2011 Chevrolet El Camino SS ? ?